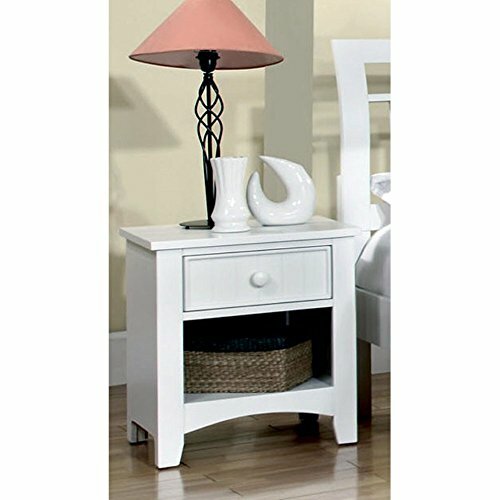 The Furniture of America Cottage Style 1 Drawer Nightstand brings understated charm to your child's bedroom. The nightstand comes with a shelf and a drawer for any loose belongings currently just floating around your child's room. Additionally, clean lines and slight flourishes around the base create a soothing aesthetic. Based in California, Furniture of America has spent more than 20 years establishing itself as a premier provider of fine home furnishings to urban-minded shoppers. The people behind the brand are moved by passion, hard work, and persistence, and their company's mission is to design the latest piece and offer high-quality furniture to trendy shoppers without compromising packaging integrity. Furniture of America offers unique, coordinated, and affordably designed furniture - not to mention exceptional style. Made of solid wood and veneers. Your choice of color. 1 drawer with a knob pull. 1 open shelf. Dimensions: 19W x 16D x 21H in..
Dimensions: 19W x 16D x 21H in.